James Garner substitutes for Rock Hudson in this hilarious Doris Day outing. Housewife Beverly Boyer (Day) happens by chance to give an executive of Happy Soap an honest appraisal of one of his company's products. Charmed by her forthright and honest manner, he makes Beverly the company spokesperson. When she becomes an advertising sensation, her husband (Garner) has to deal with the social ramifications of his wife making more money than he does. Day and Garner are both in good form, and Garner nicely portrays the mounting frustration of bewildered husband Gerald. Great film for new mommies and new daddies! Cute Feel Good Comedy Movie! Dated, mythical view of American Life, but Fun & enjoyable! First I think the film is light-hearted fun, and a great look back to the golden days of people living "The American Dream". As usual, Doris was superb as Beverly Boyer, a suburban housewife content to be home caring for her husband and two children and doing amazingly domestic activities such as bottling her own ketchup!! Wow! As much as I liked Gardner as Dr. Gerald Boyer, I wasn't too sympathetic with his disdain for his wife's decision to also take on a career. It was 1963, however, and the career woman was still more exception than the rule, so I tried to see it from that lens. The film seemed to be on the cusp of the stirrings of women entering the work force in larger numbers because when Dr. Boyer was objecting to his wife working and having a career, he was more than once referred to as a "victorian" man, in a most unflattering way. Perhaps writer Ross Hunter (producer), Carl Reiner (writer), and Norman Jewison (director) were trying to push the envelope a bit here by suggesting that women having careers was not contrary to American values of a stable homelife and happy families. About casting: I think Doris and James showed great chemistry throughout the film. I think casting Arlene Francis as Mrs. Fraleigh was a bit of a stretch however, as much as I admired her presence in the film, because she was already 58 years old in real life, so the likelihood of her becoming pregnant would be almost nil. But she rose to the occasion and played the role of a pregnant rich woman to the hilt. It was a great hook for bringing Beverly and Gerald into the lives of The Fraleigh's and their elderly father, the founder of Happy soap, thus providing the backdrop for further escapades! All quibbling aside, I think Arlene was fun in the role. A small note: Arlene died 3 years ago this month in San Francisco of complications from Alzheimers and cancer. I really enjoyed watching the cars in this film. The cars added an additional element of nostalgia as I looked back at America's earlier vehicles. I was thinking the film had been made in early 1960, but as the limo driving the Fraleighs to the hospital gets stuck in a traffic jam, and Mr. Fraleigh keeps asking this aggressive man for a shoe lace or an unused newspaper, my eyes did a double take! The guy in the car next to them was driving a 1963 or 1964 Mercury Monterey with the "breezeway" window in the back. That was my Grandfather's last car, he died in 1965 or 4, can't remember now, and my Gram kept using the car into the early 70s. Because I was particularly close to my Gram, seeing the car again touched my heart and made me smile. All in all a fun escapist comedy, highly recommended if for nothing else than Doris' classic facial responses to goings-on around her. It's time to get your own copy of the film and see what a "The Thrill of It All" it really is. Doris Day at her best! A great value, comedy DVD with original trailer! I have to give this DVD 5/5 - for the fact it's amazingly great value for money. The picture quality was superb and even though it says it's widescreen the picture is almost FULL screen size so the images were as large as life. As a bonus you also get to see the trailer which was cute. Anyhow, for those who don't know James Garner plays an obstetrician and Doris Day is the ultimate "stay-at-home Mom", until that is she becomes the face of "Happy" soap, much to the dislike of her husband ! A classic Doris Day gem... fun movie! Director Norman Jewison is known for directing "The Russians are Coming, The Russians Are Coming" (1966), "In The Heat of the Night" (1967) and "Fiddler on the Roof" (1971), to name a few. 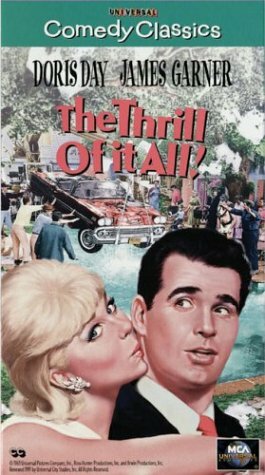 Before those films, he directed his second feature film, "The Thrill of it All", in 1963. Co-written by Larry Gelbart and Carl Reiner, the film is a comedic tale about an ordinary housewife, Beverly Boyer (Doris Day), who becomes an advertising icon for a fictitious soap that is named "Happy Soap". This transformation occurs following a dinner party attended by her and her husband, Dr. Gerald Boyer (James Garner), where she makes several honest and sincere comments about Happy Soap. Also attending the dinner party were the company's owners: Old Tom Fraleigh (Reginald Owen, better known as Admiral Boom in the 1964 film "Mary Poppins") and his son Gardiner Fraleigh (Edward Andrews). Initially, Beverly is asked to only appear in a single TV commercial, but the number of responses received encourages Tom Fraleigh to offer Beverly a long-term advertising contract. Beverly accepts, and begins making more TV commercials and her picture begins to appear on billboards everywhere. As time passes, life in and out of the Boyer home becomes increasingly disrupted with Beverly's rise to stardom prompting Gerald to become jealous of her success. He wants Beverly to return to being an ordinary housewife, but she basks in her newfound success and freedom. Other characters who add to the delight of this film include the Boyer's two young children: Maggie Boyer (Kym Karath, better known as Gretl von Trapp in the 1965 hit "The Sound of Music") and Andy Boyer (Brian Nash, better known as Joel Nash in the short-lived 1965 TV series "Please Don't Eat the Daisies"). As Beverly becomes too busy to be with their children, the Boyers hire a German housekeeper/nanny, Mrs. Goethe (Lucy Landau), whose lack of English fluency creates several funny moments in the film. Two of the funniest scenes in the film are when Gerald accidentally drives his car into a swimming pool (built in the Boyer's backyard at the behest of Happy Soap) and when Gerald delivers a couple's baby during a traffic jam. Zasu Pitts makes a brief appearance in the film; she died the same year the film was released. Carl Reiner also makes a cameo appearance dressed as a German soldier. Doris Day was one of the top ten box office draws in the world throughout the late 1950s and much of the 1960s. Although she was as gifted with a dramatic role as she was with comedy, it is for the latter that she is best recalled--and where Day was concerned such comedies usually relied on a mixture of romantic and screwball comedy levened with a fair amount of farce and plenty of pratfalls. When the movies were good, they were very good, with PILLOW TALK and PLEASE DON'T EAT THE DAISIES case in point--and Day's personal charm it often made up for such weaker scripts as DO NOT DISTURB and CAPRICE. The latter is certainly the case with THE THRILL OF IT ALL, which ranks well down the scale from PILLOW TALK but considerably ahead of such truly awful movies as THE BALLAD OF JOSIE and WHERE WERE YOU WHEN THE LIGHTS WENT OUT. In this particular outing, Day plays Beverly Boyer, married to a successful doctor (James Garner), a stay-at-home wife and mother with an upscale home, hired help, and everything a woman was expected to want or desire from the world at this particular time in American history. But disaster lies in store, and it comes in an unlikely manner. Her husband has helped a patient (Arlene Francis) conceive; the patient's husband (Edward Andrews) owns a soap company; and when Beverly in all innocence praises the product she is hired to become the product's spokesperson. Although she is at first clumsy, the public likes her--and the next thing she knows she is in hot demand for television commercials, photo shoots, and all the rest. Not only has she no time for her family, she has also committed the unpardonable sin of earning more money than her husband. Needless to say, the ideas that drive the plot are extremely dated, but very often this dated quality is part of a film's charm. But that really isn't the case here. The simple fact is that, although the film collects considerable talent, it never seems to entirely gel. Day is always very entertaining to watch, but James Garner is very much second-fiddle and in many ways reads as unsympathetic in his performance--which is very, very much "second fiddle" to Day. Ultimately, the highlight of the movie are Arlene Francis and Edward Andrews and the legendary Zasu Pitts in the small role of Day's household help. The film works best when it plays for broadslap stick, and in these scenes it is truly laugh-out-loud funny, but on the whole the script just doesn't really support the cast between bouts of hilarity, and everything else seems slightly forced. The DVD offers a good transfer, but there are no significant bonus materials. Recommened, but only just, and pretty much for viewers who already Day fans to begin with. "I'm Beverly Boyer--and I'm a pig..."